SOAPBOX CREATIONS: MFT and Friends..
Yay for release day! The February My Favorite Things Release is now live and ready to shop! Do you have a wish list going? There are so many cute things this month, I'm sure its hard to decide! When I first saw this die, I thought it either needed to be an all white skyline....or rainbow, of course! I added foam tape behind the buildings in as many solid places as I could and then added it to the card front. I love the dimension it gives all those little windows. Last, I stamped the "I Miss You'" sentiment from MFT's Coffee Break stamp set. Clean and simple! I hope you have enjoyed this countdown week! The MFT Blog will have lots more to see before you make your final decisions. And then....happy shopping! Beautiful card! I love the bright colors! 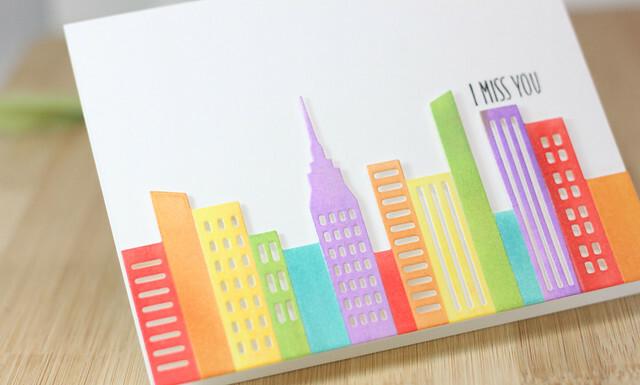 I just love how you made each building a different color and put them against the white cardstock. Super cool! Thanks for sharing! Awesome idea to make the skyline in all the different colors! So vibrant! Love it! I love your CAS and colorful card. Such a colourful card! Perfect showcase of city block die! Love how you masked and created dimension!! Way to take to time to combine all the different colors for the buildings. Thanks for sharing with us. Beautiful rainbow card. Love the cas look. Love what you make with the new goodies!!!! Love this fun and colorful card. Great inspiration, thanks for sharing it with us! I feel like you're really rocking the rainbow cities look of late (the rainbow of brownstones was you, yes? ), and I'm loving it. Thanks for sharing such a bright, happy card with us! Such a colorful card - just what we need in the middle of winter. Great release! Love the brightly colored buildings!! How fun! Wow Laurie! 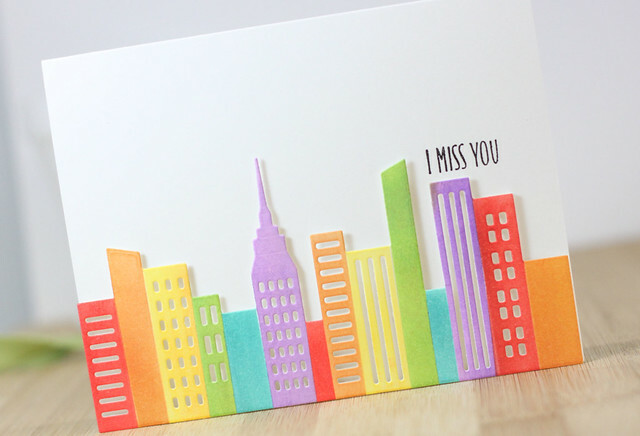 I love this new cityscape die. You did an amazing job on your card. Thanks for sharing. Bright, happy and full fun Laurie! I love the way you did the cityscape! It was a lot of work but has a big impact! Fun and fabulous! Love the City Block Die-namics! What a fun and colorful card! Love it! Awesome colors! Love your card! This is a lovely, colorful card. Thank you for sharing! 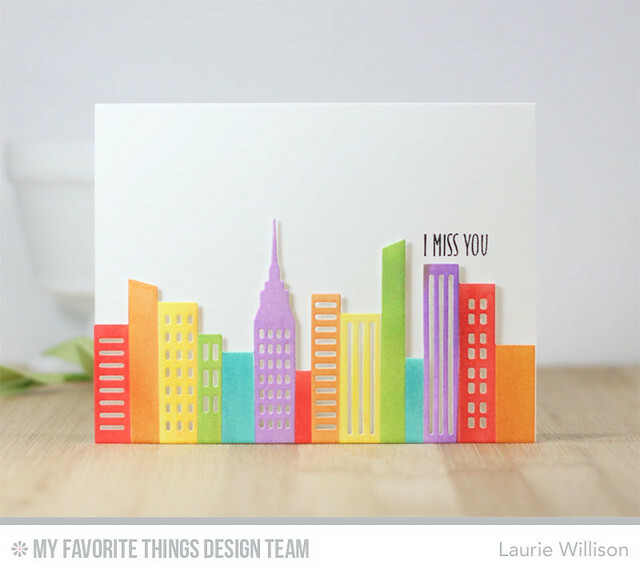 LOVE this colorful card Laurie! You are a master mind when it comes to CAS designs! Thanks for the inspiration! Love the rainbow city- simple beautiful! Such a clean design. I love your use of colors. This is SO Miami! Love it!! What a great idea! So pretty! Gorgeous card, I love the colourful buildings and the CAS design! idea to do all of the colors. Beautiful, I am a sucker for anything rainbow! Such a modern and lovely design! Such a bright and cheerful card. Awesome rainbow City Block so fun. Love the vibrant colors. Looks great on the City Block Dienamics! So pretty! I love all the colors you used! Such a fun card! Love the colourful city and such a great CAS design! You do such amazing CAS cards! I never would have thought to do each building in a different color, but it looks fabulous. Very creative! 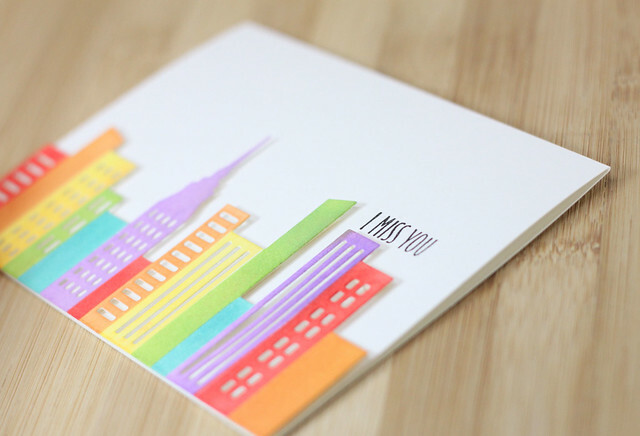 Eye catching city scape card - the colors pop against the white! Great colors! I love the simplicity of the design! Love the simplicity & all those gorgeous rainbow colors! Beautiful card! Love the rainbow city against the white what a bright great look! Oh what a fun card! Love the pretty colors and clean design. Always enjoy your cards. Love your CAS style. This card packs a punch. Ack! I love this card! So clean and colorful. And I'm a sucker for anything rainbow-colored! So bright and cheery! Another fabulous card, Laurie!